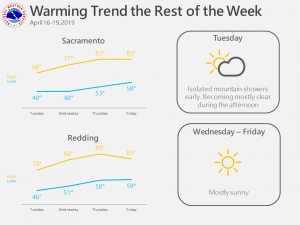 April 16, 2019 – Lingering showers taper off this morning. Dry and warmer conditions return beginning Wednesday. Some light precipitation is possible over the weekend. Scattered showers continue across interior NorCal early this morning as satellite imagery shows the upper trough moving overhead. Snow level radars and observation data indicate the snow level is presently around 5000-6000 feet. The trough moves east today with lingering showers over the mountains mostly ending in the morning. Skies will clear out in the valley with milder temperatures returning. 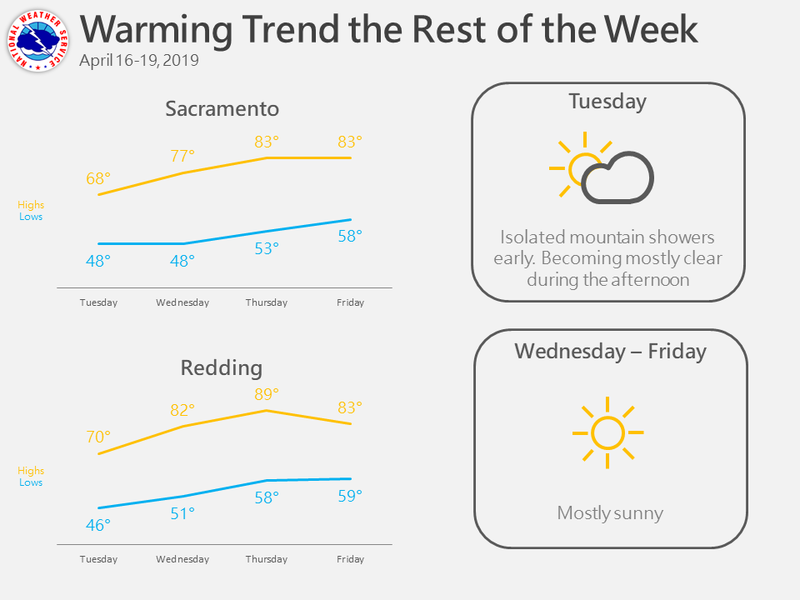 Ridge builds in bringing dramatically warmer temperatures for the second half of the week as highs across the Central Valley climb into the upper 70s to mid 80s (warmest on Thursday and Friday), which is around 10-15 degrees above average. A shortwave dropping down from the northwest will bring light precipitation mainly to mountain and foothill regions of the northern mountains and Sierra-Cascades on Saturday, possibly lingering through Sunday. Snow levels look to be above pass levels at this time and impacts will be minimal. Dry weather looks likely late weekend into the beginning of next week.